Is it just me, or with the bizarre change in the weather lately has your skin been temperamental too? I’m very thankful that my face is usually pretty clear, but with the wacky wind over the weekend (besides suffering from the sniffles) I can now feel a few spots coming up. And the lovely one I found under my nose today totally needs banishing! Eww. When I can, I love creating magical potions from my own fridge and pantry. 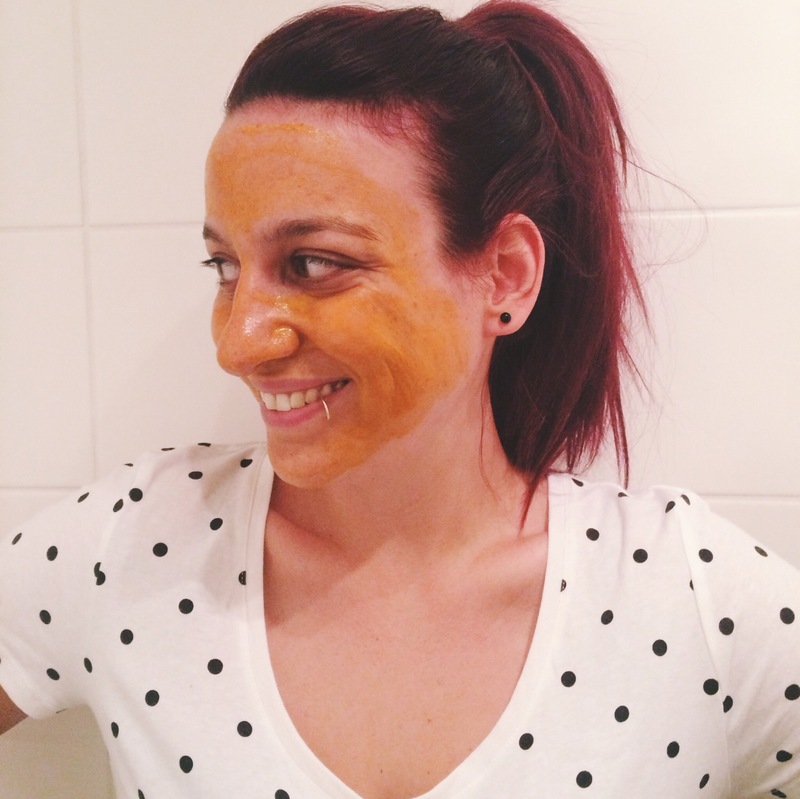 Why bother paying for a face mask when you can make your own at home? I used to love getting into the kitchen and creating my own DIY beauty products and getting back into it feels great! I forgot how easy it is to make your own natural stuff, plus it’s a good way to use up random food products like that Greek yoghurt you purchased for a recipe and used one teaspoon of! Turmeric is one of my favourite spices. When I’m not using it in a curry (yes I love to cook too), it’s anti-inflammatory healing powers are essential in sticky health related situations. Cue gross story. I once had an awful sweat pimple on my leg thanks to a pair of short shorts and sweltering weather. It was really painful, and after trying a few different medicated creams I decided to go to Google for a natural remedy. What I found was a “recipe” to make a paste with turmeric and water, spread it on the wound and cover with a bandaid. After doing so I left it for a few days and when I did remove the bandaid the awful sore was gone! Hallelujah! Granted my skin was stained, but I’d prefer a yellow spot on my thigh as opposed to a painful pimple! So if turmeric can heal the pimple on my leg, you’d think it’d do the same to the pimples on my face? Correct. I had to share this brilliant DIY recipe I discovered on Healthy & Natural World. Combine the ingredients to make a paste and apply to a clean face. Let the mask dry for approximately 20 minutes and wash off. Use a makeup remover to remove any excess “yellow” from your skin, because turmeric is a natural dye and we don’t want you looking like Bart Simpson. Moisturise your face and voila! Post mask my skin is feeling soft and silky smooth. That awful pimple under my nose actually came up to the surface too without any poking and prodding. Gross, but yay! The turmeric did tingle a little over the irritated places on my face, but a little bit of tingling was worth the results. Easy peasy, natural and anti-inflammatory. That’s exactly what I want for my skin (and I didn’t waste the yoghurt in my fridge)! What’s your favourite natural beauty hack? I like that you are not afraid to show us yourself with your facemask on. HAHA. And thanks for the handy tip. Keeping it real since 1988 T! salicylic acid can actually penetrate the pores and correct uneven shedding from within. This skin in this region is extremely delicate and thin, making it susceptible to age lines and swelling. Revolting is too extreme a word missy! Silly! I want pictures in all of your yellow faced glory!!! Need to get on it and try it!